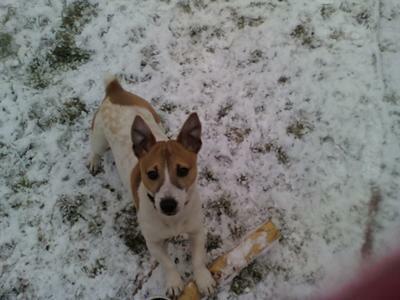 My Jack Russell Chico, is the best dog in the world, in my opinion anyway. He's six months old, brown and white in color, and is extremely playful. Its like he never gets tired. When he's not chewing anything he can get his paws on, he's jumping up and down, begging me to take him for a walk. He sleeps with a little toy reindeer that he never lets go.